I guess some idioms will soon be obsolete. Those who grow up reading books on Kindles may one day not even know what judging a book by its cover means. Perhaps a better way to say it would be to look beneath the surface. 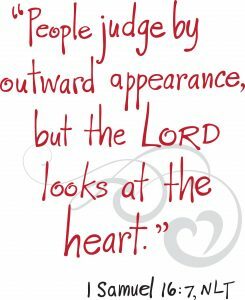 In other words, we shouldn’t judge one’s quality, talent, or character just by looking at their outward appearance. Britain’s Got Talent, the British counterpart to our American Idol, found that out when a frumpy-looking 48-year-old unemployed volunteer decided to try out for the television show a few years ago. The audience was skeptical and judges rolled their eyes until Susan Boyle sang her inspiring rendition of I Dreamed a Dream from Les Miserables. A standing ovation followed and so did a new career. Our human tendency is to make evaluations based on outward appearances. We might think a man is poor because he wears raggedy clothes and drives an old car, but he could be a millionaire. Someone might look wealthy and be a big spender, but he may have maxed-out credit cards and a house in foreclosure. In today’s superficial world, people tend to judge by appearance. We make wrong assumptions when we judge someone’s character by what appears on the surface. Meekness is not weakness. Sociability is not spirituality. Loquaciousness is not intellect. Using wisdom is not cowardice. Having biblical knowledge does not mean one is close to God. The scribes and Pharisees appeared spiritual on the surface, yet they judged Jesus and His disciples’ religiosity because they saw them eating without washing their hands. That was a definite no-no against their purity laws which were a big deal at the time. These laws were what the religious hierarchy used to determine one’s devotion to God. (Mark 7:1-8) Some thought Jesus was a glutton and drunkard because he ate and drank with sinners. (Luke 7:34) They didn’t know they were criticizing the very Son of God. Samuel would have chosen Jesse’s first born son Eliab to replace King Saul. After all, he was tall, handsome, and athletic. When Samuel saw him he said, “Surely the Lord’s anointed stands here.” (1 Samuel 16:6, 7) But God refused him because God looks on the heart, not the outward appearance. So a lowly shepherd boy name David was chosen instead. Consider this… Making snap judgments based on appearances can lead to prejudice, segregation, and stereotyping. Yet, it is easier to judge quickly than to take the time to get to know people. Only through knowing people can we determine how they think or feel and where their hearts are. Only by looking beyond the surface can we discover those hidden qualities, talents, or character traits worth finding. 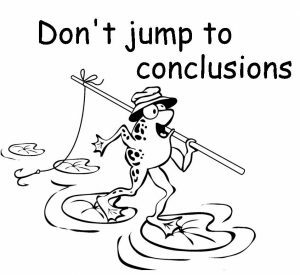 One final thought… Jumping to conclusions about someone based on outward appearance can have you leaping in the wrong direction.